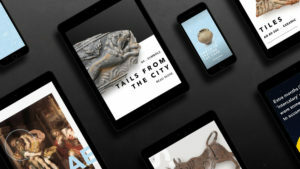 AllofUs has created a new mobile experience for London Mithraeum Bloomberg SPACE a new cultural destination that opens to the public today on the site of Bloomberg’s new European headquarters in the City of London. 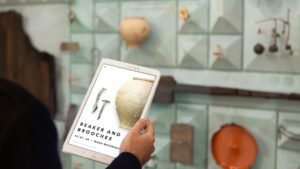 The digital interactive resource is designed to help visitors uncover the stories behind the remarkable selection of Roman artefacts on display, all of which were uncovered on the site. The new Bloomberg building, designed by Foster + Partners, is located between the Bank of England and St Paul’s Cathedral on one of the UK’s most significant archaeological sites. The Temple of Mithras, perhaps the most famous Roman discovery in 20th century London, was found by chance here on a bomb site in 1954. Bloomberg committed to restoring the temple, and to carrying out further excavations on the site. The ‘Bloomberg dig’ in 2012-14 was one of the most extensive to have taken place in London; it involved more than 50 archaeologists from MOLA (Museum of London Archaeology) who uncovered 14,000 significant Roman artefacts. 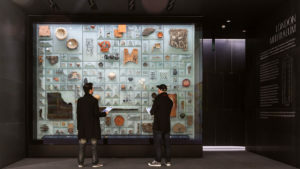 More than 600 of these objects were carefully selected to present to visitors to London Mithraeum Bloomberg SPACE, in a giant, state-of-the-art display case measuring 4m x 5m. The display is part of London Mithraeum Bloomberg SPACE – an area of the new building open to the public to showcase the reconstructed ancient temple, a selection of the Roman artefacts uncovered during recent excavations and a series of contemporary art commissions responding to the site’s history. AllofUs was tasked to allow visitors to explore the volume and variety of artefacts in the case, discovering the hidden stories that the objects reveal about what life was like in the Walbrook Valley many centuries ago. The agency’s team worked closely with the MOLA and the Bloomberg Philanthropy team to select and construct narrative stories that conveyed the purpose and function of the selected objects. Building on the success of its Serpentine Galleries Mobile Platform (also funded by Bloomberg), an experience was designed to complement the physical space and act as a companion for visitors, allowing them to contextualise what they are seeing without distracting them from the real world. The challenge was to create a mobile-first, location-specific platform that would bring a modern context to the historical nature of the exhibit. The team needed to engage visitors with an elegant, intuitive interface, that could be understood immediately with compelling animated stories, appealing to both young and old.